When Rodrigo Duterte led the Presidential race in the national elections by more than 3 million votes, the contest for the top post of the land suddenly became boring. It was obvious from Duterte's increasing advantage over his rivals, that he will be the 16th President of the Philippines. When Grace Poe conceded, Duterte's advantage over number 2 Roxas had already ballooned to about 5 million votes. But what kept a lot of people glued to the election coverage was the exciting and tight race between vice presidential candidates Ferdinand "Bongbong" Marcos, Jr. and Maria Leonor "Leni" Robredo. Marcos led early in the vice presidential race when the partial unofficial tally on May 9 began. He gained hundreds of thousands of votes with each update, his lead over Leni going up to around a million votes. But at 11:20 P.M., that lead went down to 432,074 votes. An hour later, Marcos was ahead by only 116,590 votes. With each update from different media outlets, Bongbong's lead got smaller and smaller. As of 2:28 A.M. Marcos was leading by only 38,926 votes. 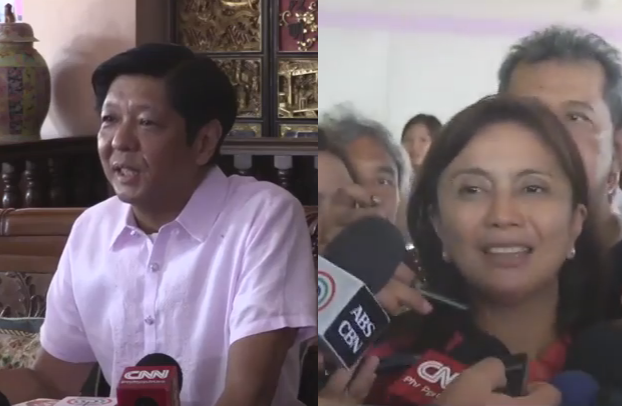 The neck to neck battle for the vice presidency became a hot topic on social media, as expected. The hashtag #LabanLeni was at the top of Twitter's trending topics, reaching 180,000 tweets at around 4 A.M. On the second spot is the hashtag #BBM4VP with 30000 tweets. At 3:29 A.M., Robredo overtook Marcos by a hairline 575 votes and the Robredo camp couldn't help but rejoice. About 20 minutes later, the feisty widow's lead over Marcos went up by a slim 8,876 votes. The Marcos camp then held a press briefing, expressing their concern as to the reversal of the trend in the VP race. They want to know where Robredo's votes are coming from and wants to put a stop to the partial and unofficial counting of votes. They said they want it to stop, so there wouldn't be any problem. As of 6:55 P.M on May 10, Robredo's lead over Marcos had ballooned to 224,816, with 93.58% of the precincts reported. Leni got 13,713,139 votes while Marcos had 13,488,323 votes. The rest of the vice presidential candidates have conceded, with Alan Peter Cayetano making the first announcement. The other vice presidentiables including Antonio Trillanes, Chiz Escudero, and Gringo Honasan also conceded in the morning of May 10. The estimated 400,000 votes from Filipinos overseas will only be transmitted tomorrow, May 11. If Marcos gets 50% of those votes, Leni's lead will be wiped out. So, at this point, it is still anybody's ballgame. The nation is still holding its breath as to who its next Vice-President will be. Will it be the son of a former dictator or the widow of a revered public servant?